Evolve is proud to announce that Pfizer received First Place at the 2016 IDEA (Interior Design Excellence Award) Award Ceremony held last week in Richmond, VA! 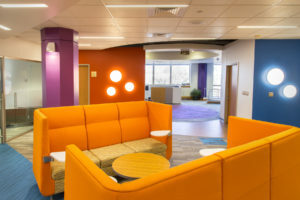 We have worked with Pfizer on several exciting projects including the award-winning renovation of their Research and Development Headquarters here in Richmond, VA. The design solution converted a “standard” office space into a collaborative multifunctional work place of the future. 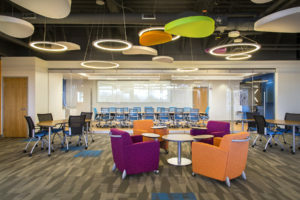 The new space offers mobile tables and touchdown benching for collaboration. It is balanced with “heads down” focus booths, and quiet zones with lounge pods for individual work. The bold use of color aligns with Pfizer’s brand. The colors were chosen, along with asymmetrical lighting and dimensional ceiling elements, add energy to the space. The use of glass allows natural light into the center of the space. 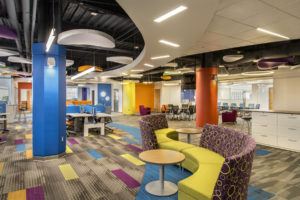 This project is a great example of how Richmond companies are embracing design for the millennial workplace of the future. The American Institute of Architects (AIA) Buffalo/ WNY Chapter and the Buffalo Architecture Foundation announced the recipients of the 2016 Architecture Service Awards yesterday evening at the ceremony at The Eleanor and Wilson Greatbatch Pavilion at the Martin House complex. Divided into three different categories including design, service and pro-bono, the AIA awards are presented annually to outstanding projects and remarkable people in the industry. (Pictured L-R) Jim Maurer, recipient of the Young Architect Award, and Joe Kedron, recipient of the Edward B. 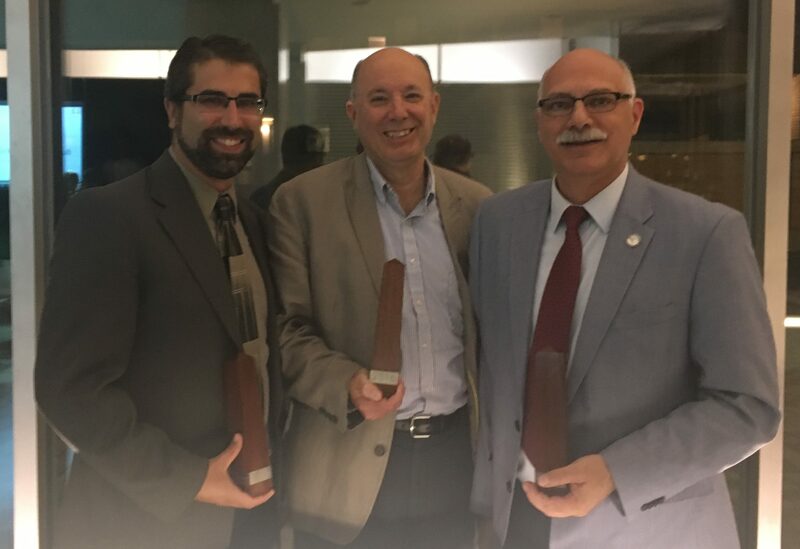 Green Distinguished Service Award and Tom DeSantis, Senior Planner for Niagara Falls who was the recipient of the Joseph Siracuse Service Award. Wendel’s Jim Maurer is this year’s recipient of the Young Architect Award, which is given to an individual who at an early state in their architectural career has shown exceptional leadership in design, education and/or service to the profession. He has worked on several award winning projects throughout Western New York, including Fletcher Music Hall at the Chautauqua Institution and the Niagara Falls USA Official Visitor Center. Jim is the architect for the Peace Bridge Authority’s Customs and Border Protection project. Joe Kedron, an architect at Wendel, was awarded the Edward B. Green Distinguished Service Award which recognizes outstanding service to the local AIA chapter. For the past 26 years, Joe has been an active member of the American Institute of Architects. In addition to his longstanding membership, he served on the AIA Buffalo/WNY Chapter Board from 2006-2014, and as Treasurer from 2008-2012, President-Elect in 2013 and President in 2014. Joe focuses on hospital work across WNY and has been involved in projects such as Buffalo General Hospital (Deaconess Tower), Kenmore Hospital (Patient Room Replacement Addition), McAuley Nursing Home, Buffalo VA Medical Center, Children’s Hospital PICU addition, various projects for Eastern Niagara Hospital, ECMC (ICU and Dialysis Renovations) and a variety of Kaleida Health projects. Joe is also active in his community and has donated countless hours to improvement efforts in many areas throughout Buffalo such as the North District of the City of Buffalo, the North District Waterfront, and Riverside Park. He is also part of a citizen group which is overseeing public art as part of the Niagara Street reconstruction project. Many projects do not really start when the first golden shovel is ceremonially thrust into the ground. Often, before that momentous occasion arrives, the hard work of planning for a project has been going on behind the scenes for months, if not years. The expression “shovel ready” is a catch phrase in today’s economic development world, but what does it really mean? Well, that depends on who you ask. For a city, town or village preparing a parcel of land for development or to be marketed as a business park, for example, it can mean one thing. It might entail the extension of water, sewer and utility infrastructure to the site and the identification and mitigation of any environmental restrictions. For a company wanting to secure building permits and approvals to get an expansion project underway, it can mean something entirely different. They literally want to be able to put a shovel in the ground as quickly as possible. For the purposes of this article, the focus will be on the municipality’s perspective of shovel ready. What does a municipality in New York State have to do in order to facilitate a shovel ready site? In basic terms, being shovel ready means a site or property has gone through some sort of process or set of actions to make it ready for development to a greater extent than it would otherwise be. There are varying degrees of shovel ready, often dependent on state policies and procedures. However, the common theme is that some sort of effort is expended to prepare a parcel of land in order to expedite actual construction. According to Empire State Development (New York’s main economic development agency), “Shovel Ready Certification is another business-friendly, common-sense, job-creating tool that will continue to ensure New York State retains its competitive edge in the global marketplace.” In short, it cuts out red tape and other permitting processes often responsible for slowing development. It is also important to note the preparatory work required to get a site a certain level of shovel-readiness requires a vision and commitment. Why? Because this work occurs before an active or interested economic development lead arises, not after. There is certainly risk involved. Why Shovel-Readiness is Relevant in Today’s World?